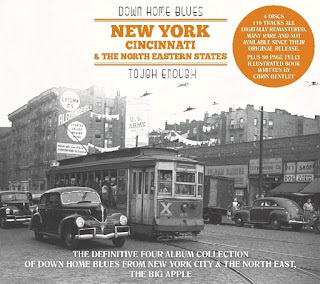 I just had the opportunity to review the most recent release, Down Home Blues - New York, Cincinnati & The Northeastern States - Tough Enough from Wienerworld Presentations and it's really terrific. This 4 cd sent is accompanied by a 80 page cd sized book that has extensive bios, photographs and really nice record labels making this an incredible package. Opening is Alabama born, Wilbert Thirkield or Big Chief Ellis who taught himself to play piano at his aunt's house. His offerings here include Big Chief's Blues and I Love You Baby with authentic blues roots sounds, solid piano and vocals. North Carolina born, Seth Richard, known as Skoodle Dum Doo and Sheffield contributes strong country blues in Tampa Blues and Gas Ration Blues with great vocals, yelps, harp and guitar. In essential Piedmont style, guitarist Gabriel Brown is smooth and creamy delivering some of the best roots blues that you've never heard. Excellent! Chicago born, Bob Camp and His Buddies really gets the boogie woogie going on Gonna Pitch a Boogie with rolling piano and super lead guitar. Irene Wiley's Boa Hog Blues is classic female blues vocals from the time with the seductive play and strong vocals and in this case backed by strong piano and guitar accompaniment. Digging into the low down blues with Big Chief on Poor Man's Blues and Mr. Radio Announcer, Big Chief with the fancy finger work of Brownie McGhee on guitar. Hot piano boogie, Fred's Boogie Woogie is great track with Louisiana born Fred Dunn on vocal and piano. Rosita Chicken Lockhart has a different kind of polish backed by Andy Johnson and his trio. With real country styling, Allen Bunn (Tarhill Slim) sings Somebody Changed The Lock and You're A Little Too Slow accompanying himself with tight guitar riffs. Very fine. Brownie McGhee, accompanied by Big Chief on piano plays How Can I Love You and My Bulldog Blues followed by Sonny Terry's classic harp sounds and vocals on Telephone Blues and Tell Me Tell Me. This is a really terrific assemblage of artists and music and my descriptions only an abbreviated description of one of 4 discs. Each disc includes additional artists and each disc is as good as the first. This really is an amazing package. Other artists include, John Tinsley and Fred Holland, Gabriel Brown, Hank Kilroy, Alonzo Scales, Sunny Jones, Doug Quattlebaum, Otis Hinton, Jimmy Newsome, Robert Henry, Doctor Gaddy and his Orchestra, Square Walton, Cousin Leroy, Jack Dupree, Eddie Riff, Mojo Watson, Jesse and Buzzy, Little Red Walter, Emright and Mattie, Kine Morgan, Little Boyd and the Blues Bees, Guitar Luther, Guitar Nubbit, Guitar Crusher, and Curley Mays.